Last week, my neighbor asked me to help her with a reveal cake she was making for her friend's baby shower. 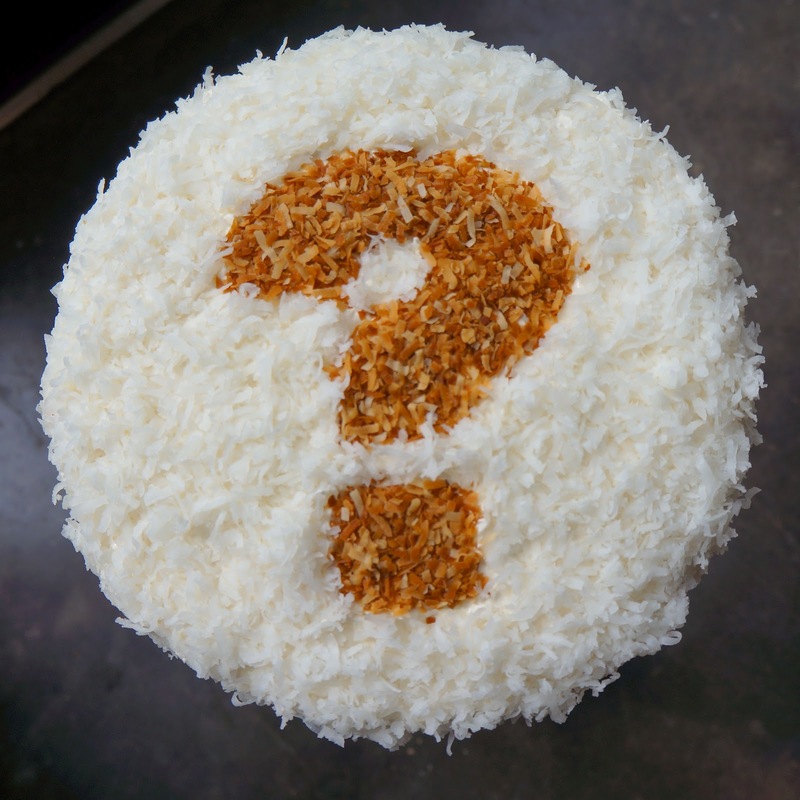 For those of you that don't know what a reveal cake is, it is a cake to "reveal" the gender of the baby to friends and family. Of course I said "Yes!" I have never made a reveal cake and I rarely bake a layer cake because cupcakes are easier and I can eat as many as I want without anyone keeping score. So, we made one of my favorite vanilla cake recipes and simply just added a generous amount of blue food coloring to the batter. 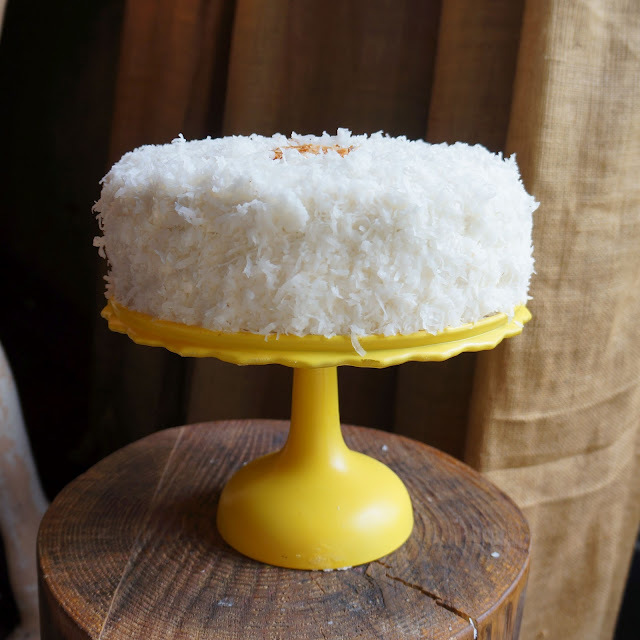 The mother-to-be had requested a coconut flavor, the frosting is a coconut frosting and the whole cake was coated with untoasted and toasted coconut. Preheat oven to 325 degrees. Line cake pans with parchment paper; set aside. In the bowl of an electric mixer fitted with the paddle attachment, combine flours, sugar, baking powder, and salt; mix on low speed until combined. Add butter, mixing until just coated with flour. In a large glass measuring cup, whisk together eggs, milk, vanilla, and food coloring. With mixer on medium speed, add wet ingredients in 3 parts, scraping down sides of bowl before each addition; beat until ingredients are incorporated but do not overbeat. Divide batter evenly into two 9" cake pans. Bake, rotating pan halfway through, until a cake tester inserted in the center comes out clean, 30-35 minutes. To make the buttercream, in the bowl of an electric mixer fitted with the paddle attachment, cream butter until smooth and creamy, 2 to 3 minutes. With mixer on low speed, add 6 cups sugar, milk, and vanilla; mix until light and fluffy. If necessary, gradually add remaining 2 cups sugar to reach desired consistency. Add 1 cup of sweetened shredded coconut. To assemble cake, place one cake layer onto cake stand. Spread buttercream evenly. Place second layer above frosting, then spread more buttercream on top and around the sides until all the cake is covered. Carefully press shredded coconut all cover the top and sides.We used toasted coconut to make a big question mark on top.